Contemporary works are presented at “Cortona On The Move;” focused on innovators in travel and documentary photography, this festival annually hosts exceptional figures in the industry, from great masters to young talents. There is a wide-ranging selection of exhibitions, events, and portfolio critiques. Continuing its legacy as an idea inspired by the ONTHEMOVE Cultural Association, the festival will run until October 1. 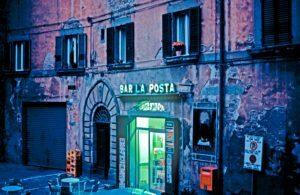 Located in Cortona’s Girifalco Medici Fortezza, Cortona On The Move serves as a dynamic artistic center, attracting those with a passion for photography as the art of documentary. Since its humble beginnings in 2011, the quality and quantity of exhibitors at Cortona on the Move has grown, along with the number of visitors it attracts. The festival has become a point of reference of inspiration for both national and international audiences. An interesting series making its debut is “Obama: An Intimate Portrait,” which shines him in the light as both a politician, and in moments of closeness with his wife and family. The author is Peter Souza, Obama’s official photographer, who started out with the Chicago Tribune and has collaborated with National Geographic and Newsweek. Another work by Donald Weber, “War Sand,” offers an extensive journey to the beaches of Normandy on D-Day also thanks to footage never before released from military intelligence sources. One of this year’s exhibitions includes the work of Matt Black; invited to join Magnum Photos, he decided to explore the issue of poverty in the United States. Over the past two years, the photographer has traveled 80,000 miles across 46 states to document communities that have a poverty level of 20% or more. His work seeks to highlight the growing gap between the rich and poor. Another artist being displayed is Donna Ferrato, showcasing life as an “American Woman, 1970s – 2010s.” Her collection comes from personal archives, and which also includes episodes of domestic violence. This photo series has launched the project of the Domestic Abuse Awareness campaign, as well as I Am Unbeatable campaign. “Cortona on the Move” also organizes the Happiness on the Move contest. This year, the award recipient is Pierfrancesco Celada. His installation, Instagram Pier, represents the vitalization of joy, how happiness can come with ease and the simplicity of pleasure. Adding to the dynamics, the festival is in partnership with Canon, which will be holding two workshops specific to their products: how to best use flash, including speedlight. “Cortona on the Move” will also be hosting their own series of workshops, taught by internationally acclaimed teachers. The classes are open to all levels, and are in two-day sessions, commencing July 29-30 with Post Production using Photoshop by Marco Olivotto. On August 5-6, Giulio Di Sturco, two-time World Press Photo winner, will discuss techniques in documentary photography, and from September 16 – 17, Richard Anson will share his secrets of travel photography (also in collaboration with the Lonely Planet), in English. Ticket prices range from €3-€6 for a single exhibition, but there is a flat full fee of €15, €12 reduced. Group rates available. Hours are 10 am – 8 pm through September 3, 10 am – 7 pm from September 4 – October 1.